Description: D&H 7605 is brand new and is running without its herald on the shorthood in this scene just barely a month after the formation of Conrail. The signs of the benefits the D&H received from the creation of Conrail are clearly evident. 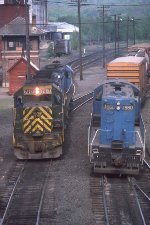 Description: With some ex-Lehigh Valley and Reading units leading a pair of GE's. Date is approximate. Description: The heavy snow we chased through, then the sun came out when we got to Binghamton! Description: Note the snow on the plow, was in a heavy snowfall where I shot before here! 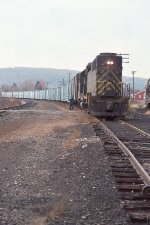 Title: Photo was taken with train symbol and trailing units unknown. Description: POPY pulling a cut of cars out of the yard at East Deerfield West. 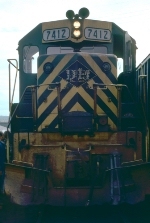 Description: Former RDG GP-39-2 3412 became D&H 7412 on 4/1/76 and the RDG paint still looks decent eight years later. Description: Eight years later, that RDG paint still looks decent. 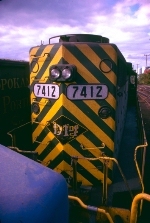 Former RDG 3412, now D&H 7412, at Mechanicville. 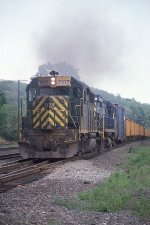 Description: This GP 39-2 was conveyed from the Reading at Conrail startup a dozen years earlier. Looks like its not quite ready to give up on the old road. This unit, and 7410, would have Reading markings on them til retirement. Description: The pushers on this PYRP are into the climb and working hard. The head end is in the steep part of the grade approaching Moottown Rd, working to roll their almost 100 cars to the tunnel and over the top. Shot at Hanock Rd in Sanitaria Springs. Description: PYRPs pushers cross NY 7 on the stone arch bridge. Seen from a side road off NY 7, this shows the scenic beauty of this part of the D&H. As I write this in 2015, this shot is pretty well treed in. Description: The pushers on this PYRP have made the tunnel, with the trailing unit showing that the Reading may be gone, but not forgotten. 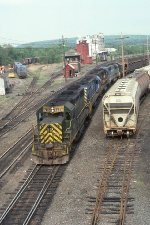 This is one of the GP 39-2s conveyed at Conrail startup, still in its original colors.